First I'm going to announce the winner of MY VERY UNFAIRY TALE LIFE. 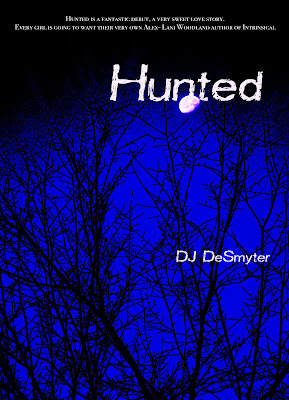 Today I’m e xcited to interview DJ DeSmyter about his debut novel HUNTED, which was released on August 9, 2011. I met DJ at Maggie Stiefvater’s book signing in July and learned he’s a debut author. I found HUNTED to be a fast read and I loved that the focus was on Lily’s and Alex’s developing relationship more than the paranormal aspects of the story. That’s what really sucked me into the story. Seventeen-year-old Lily Atwater has always kept to herself, living a lonely life with her workaholic dad. Not the most thrilling life, but it’s quiet and ordinary, two things she’s come to expect from living in Victor Hills, Michigan. Hi DJ. Thanks so much for joining us. Well, let’s see... I’ve been an avid reader for as long as I can remember and writing was always something I enjoyed, but never took seriously. Actually, when I was a toddler, I had a speech impairment and my parents were told I would never speak or write. So, my parents have always encouraged my passion for reading and when I told them I wanted to be a writer, they gave me their full support. It wasn’t until after I read Twilight a couple of years ago that I realized writing was something I wanted to pursue. I wanted to create characters and worlds that readers would fall in love with—that I would fall in love with. I just never expected my dream of being published to come true so soon! 2. Wow! You’ve come completely around circle from a toddler who might never write. It’s interesting how many authors get inspired to write after reading a book. Me too. I loved how Alex’s family is a family rather than part of a pack of wolves. How did you decide on this and what else did you do in plotting HUNTED to make it different than the other werewolf stories out there? Since family has always been important to me, I always knew Alex’s family would be a real family. I also knew I didn’t want my main werewolves to act like wolves. I wanted them to be as human as possible. A lot of other werewolf stories focus on the animal side, so I decided to do the opposite. 3. That was so smart to take a different focus than all the other werewolf stories out there. It makes your story stand out. Lily starts out as a shy, lonely teenager not even very close to her dad, the only member of her family. But she really blossoms through her relationship with Alex. Tell us a bit about her character development. Did you have any challenges writing from her POV? I actually have a lot of friends who are girls, so writing from her POV was rather easy. The book was originally supposed to be told solely from her view, so I had a firm grasp of who she was early on, so that also helped make the writing process smoother. 4. You di d a good job in developing the romance between Lily and Alex. It was one of my favorite parts of the story. Do you have any tips on writing romance in YA novels? Thank you very much! I’m a romantic at heart, so I’m happy to hear people are enjoying Lily and Alex’s relationship. 5. Ha! Some of us wouldn’t want to admit the negatives of our relationships in public. But that’s good advice. 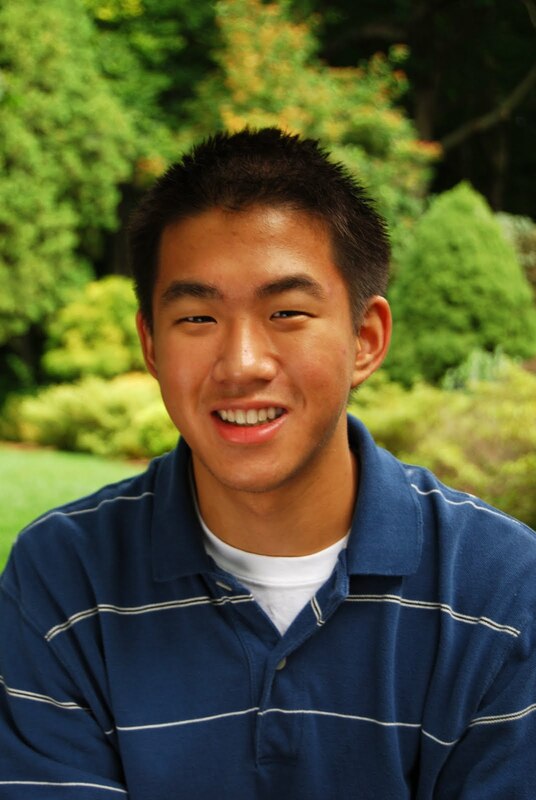 You wrote HUNTED while in high school and also blog. (DJ, correct this if I’m wrong). How did you juggle the demands of high school, homework, blogging, and writing? What was your writing process? 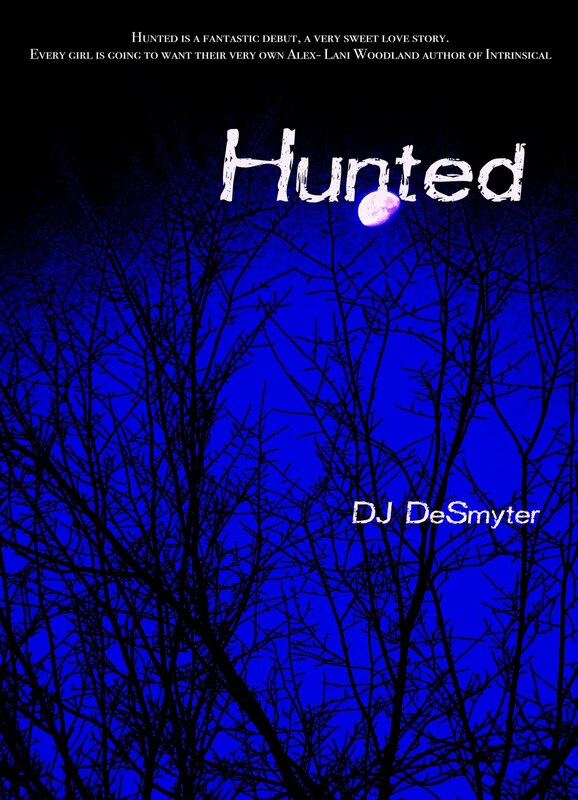 Hunted was written my senior year and it was completed thanks to a lot of late nights. But, don’t worry, I always completed my homework! I usually worked ahead and finished my assignments early, which gave me more time to read and write during the week. I started with the prologue and from there I wrote the rest, beginning to end. Compared to my previous efforts, the writing process for Hunted was rather smooth. I usually run into roadblocks with projects because I don’t work from an outline, but I encountered very few issues with the story. 6. Now that my daughter’s in 9th grade, I’m even more amazed you could keep up with homework and write. Let’s move onto the business side of writing. Tell us about your road to publication. My journey to publication was surprisingly quick. I found out Pendrell Publishing was open to unagented submissions, so I submitted to them on a sort of whim. I almost didn’t end up sending a submission, but my critique partner had done a lot of work on Hunted and I didn’t want their work (nor mine for that matter) to go to waste. The rest is, as they say, history, but I couldn’t have asked for a better home for Hunted. I have loved every part of the process and the team at Pendrell is amazing. 7. You’re making the rest of us jealous. Just kidding. We’re happy for you. How have you been marketing HUNTED? Do you have any advice for us aspiring authors? ARCs were sent out to bloggers and other reviewers, and the online community has been instrumental in getting the word out. Our society is practically centered around social networking and we’ve been trying to use that to our advantage. I’ll also be attending BEA and the Romantic Times Convention next year, as well as Epic ConFusion, which is a sci-fi/fantasy convention in Troy, MI. My advice would be to write, read, and live. Write because you love it, read because you love to, and live because the world has so much to offer. 8. The conferences sound like they’ll be fun. I’ll have to check out the convention in Troy one of these days since it’s in Michigan. What are you working on now? I’m currently working on a new project, but it’s not a sequel to Hunted. I’m really excited about this new story, though, and I’m trying my hand at writing in present tense. That’s all I’m going to tell you, though. Thanks DJ for all your advice. Good luck with your book. You can visit DJ at his blog. I'm giving away a copy of HUNTED. All you need to do is be a follower (just click the follow button if you’re not a follower) and leave a comment by midnight on November 26th. I’ll announce the winner on November 28th. If your e-mail is not on Blogger, please list it in your comment. International entries are welcome. Next week I'll be interviewing a teenager who’s also a book blogger for my Ask The Expert series and giving away another book. Then on November 28th, I’m interviewing another debut author Scott Tracey and giving away a copy of WITCH EYES. I have a bunch of awesome interviews and giveaways set for early December too. Great Interview. Twilight inspired me as well and my novel will be released Dec 1st. I wonder how many other authors were inspired by the saga. Thanks so much DJ for letting me interview you. Your journey to publication is inspiring. Thanks for introducing me to DJ DeSmyter and his book. I loved hearing DJ's story and learning about his book. Thanks for this interview. Ugh, I mean hi DJ. *slaps head* I can't believe I called you Alex! Wow. I'm amazed and humbled by DJ's story. Congrats! I'm impressed that DJ completed this novel while still in high school (and that it wasn't his first book)! That's amazing. What a great story! Both in HUNTED and DJ's own. Inspiring. Great interview, Natalie! Sounds like a great story. sounds like DJ has had a pretty incredible journey, too. Never speak or write?!?! Wow, doubly impressed (and wondered if the same would be said today, ya know?). This book sounds GREAT, right up my alley and I love that you were influenced by the romance etc. in Twilight! I've been wanting to read Hunted for months. The journey brings a whole new history to this book. Wonderful! Great interview! I've been eyeing this one since I saw it on a few other sites. Great interview DJ. I like the sound of your novel having enjoyed the twilight series myself too and other YA novels like the chaos walking trilogy. Thank you, Natalie, for such a great interview and I'm so glad you all have enjoyed reading it :-). Congratulations on Hunted, DJ. It sounds like you've really got a great handle on how all of the writing process works. I wish I'd been so knowledgeable in High School! Such a wonderful interview. Thanks so much for sharing your story, DJ. Wishing you the best of success for now and for your continued writing career. Thanks for the interview! I'm dying to read Hunted and would love to be entered in the giveaway. I'm a GFC follower as Stephanie Parent. Wow--I loved hearing about DJ's path to publication . . . and am looking forward to the book (and I'm sure my teen daughter will want to read it too). I'm in for the contest--the book sounds intriguing. I'm a new follower. I retweeted the contest, and put it on facebook. this is new to me but sounds really interesting! Hey! Thanks for this interview (and the giveaway!) Great advice on developing romance...best of luck with your book and looking forward to adding it to my reading pile, I must say! Loved the interview. Hope I win the book. HUNTED sounds like an intriguing novel. Great interview guys!